I don’t usually comment on news or the latest controversy on the net but I had this urge to pen down my thoughts for the recent misfortune about a Gorilla named Harambe at Cincinnati Zoo in Ohio who was killed in order save the life of a 4-year-old boy. This news has set a wildfire on the net and angered a lot of netizens who were unhappy with the turn of events. In short, a 4-year-old boy fell into this Silverback Gorilla’s enclosure while he was climbing through the barriers and bushes. He fell right into the moat and the Gorilla came over and then drag him across the moat. I was reading all the online sources on this news with great interest because people are starting to question the existence of zoos and whether it is worth killing an animal to save a human. It got me to start thinking about these controversial issues which probably no one has an answer to it. Below are just my one cent worth of thoughts and opinions and I am in no way trying to prove anything. 1) Is the life of a human more important than an animal? 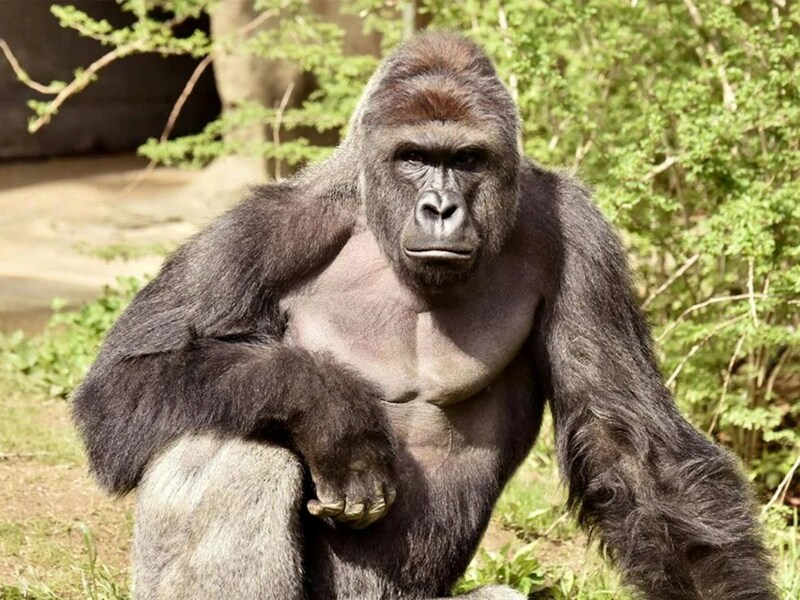 As further investigations carried on along with discussions and comments spewing across the internet, some felt that it was justifiable to kill the Gorilla to save the child while others felt that the Gorilla should not be killed because based on the video footage, the Gorilla seems to be protecting the child. Others even felt that the child’s parents should be held responsible for this. Some even suggested that the parents of the child should be shot dead. Okay, let’s put it this way. Replace the gorilla in this situation with a man who has the potential to crush a coconut in a split second. We can’t communicate with this super strong man because he doesn’t understand our language. He seems agitated and he is dragging your child across the waters. You had no idea what he is going to do but he seems threatening. What would you do? Maybe it isn’t whether which lives, the animal or human, is important here. When the zoo made the decision to shoot the gorilla, it was due to its threatening behavior which they observed, not so much of the fact that they think an animal’s life is unworthy. 2) Should Harambe be shot dead? But I guess the world miss the whole point right here. First of all, we had no idea how the gorilla was reacting based on the video footage published online which has gone viral. The video only shows the Silverback gorilla dragging the child across the moat and we had no clue as to how the Gorilla was reacting after that. Most of us are not experts in reading animal behaviors and it is certainly difficult to tell if the Gorilla was committed to protecting this child throughout this whole ordain. Who knows if he decided to change his mind when he had screams from the crowd and panicked? In my opinion, the reason why people are angry over the actions were taken by the zookeepers is because it doesn’t seem like the zoo has considered or attempted to seek other ways of saving both lives before shooting the gorilla dead. It was only mentioned they did think of tranquilizing the animal but they were afraid that it would only make the gorilla more agitated. But, what about exploring ways such as keeping the crowd calm and disperse the crowd to calm down Gorilla? Did the zookeepers attempt to enter the enclosure to save the boy? Did they attempt to try other ways of salvaging the whole situations to save both lives? It wasn’t very clear through their explanations for killing the Gorilla. Should they have explained clearly in their decision-making process, perhaps it wouldn’t have stirred up angry emotions among the people, especially animal activists? Not to also mentioned that this Gorilla is an endangered species which makes this issue really tricky. Would a zoo risks having an endangered species killed? Nevertheless, the child was saved. Imagine what the situation would be like if both were killed and none survived? Did they have to really shoot the Gorilla dead? If I am not wrong, they must have thought that that was the best way of taking the boy out of the enclosure. I mean, the toddler isn’t able to run or climb out of the enclosure right? One thing for sure, there aren’t any brave souls around to attempt to save the boy by entering the enclosure. Next, they didn’t want to drag the situation any longer and just observe what happens next which I really wonder what would happen if the toddler was stuck with the gorilla for hours. I also wouldn’t think that the gorilla would ‘surrender’ the boy and bring him to the zookeepers, would he? And suppose if Harambe decides to do something to the child, and the child dies, all angry eyes will be on the zoo. Angrier voices would be heard. 3) Should the boy’s parents be responsible for this mistake? Wait a minute, shouldn’t we blame the boy too? Fingers will be pointed at the boy if he was a 16-year-old boy. We are definitely not in any position to point fingers at anyone when we are not involved in this incident and not especially when your loved ones is involved. Human makes mistakes too, right? How can you expect any parents to be monitoring their child 24/7 all the time? Are you to say that you, as a parent, has done your duty of keeping your eyes watched on the child 24/7 even while they were sleeping? If you call yourself a responsible parent who showed no negligence to your child at all, then you have every right to say that the parents should be stoned. Instead of getting the relevant authorities to arrest the parents, I suggest getting the parents to contribute back to the zoo by donating money or volunteering their time at the zoo. Yes, in a way, even though it’s not entirely their mistake but they should have some sense of responsibility for this matter. If they were grateful enough, they would do so wholeheartedly as their son’s live is saved at the expense of killing the animals. They could even join and help out volunteer organizations to share their story so that others can learn from this painful experience and hopefully, history will not repeat itself. This is so much better than arresting them or locking them up in prison, don’t you think? As a society, let’s exercise grace. 4) Should we even have zoos? Last but not least, there’s also another argument highlighted from this whole saga. Should animals be kept in zoos? The fact that zoos still exists today happens for a reason. Although I am not totally for it, let’s think about it this way. If the zookeepers were to remove enclosures and set the animals free, I am pretty sure we would have to return back to the stone age where they played hunger games a.k.a survival of the fittest. Unless humans decided to transport all the animals to an island and keep them there forever, then we wouldn’t have to fight for ourselves to stay alive.